This is book 1 of my Ramadan 2013 Reading challenge. I pick up this book expecting something from Algeria. Actually, this book is entirely about the city of Kabul and its inhabitants. As if invasion was not enough to bring Kabul to its knees, The Taliban have taken over the city and the lives of people . It is indeed a very gruesome read. I love the literary style of the author, usually I don’t dwell on these things but this book was very well written. I wish I had started reading Yasmina Khadra years ago. 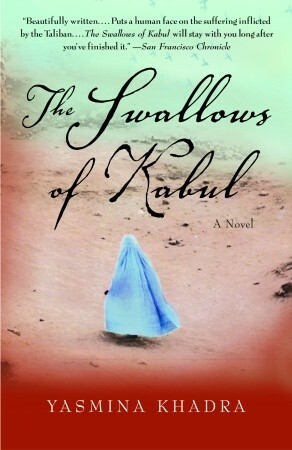 The swallows of Kabul was so beautifully written and so vivid. The portrayal of Women: Zunaira Vs Mussarrat. I really love the contrast between these two women. Zunaira, the educated and rich women is the kind of women we are used to see anywhere else in the world. She is beautiful, has class, knows her place in the world, has a career, a life and a husband who loves her. The most surprising thing is that this woman actually lives in Afghanistan or should I say used to live before the Taliban took power. Musarat on the other hand was not educated or had a career but still I perceived her to be a regular women. She holds her own against her husband. Women are indeed strong creatures in this novel. I suppose that is why the Taliban must control them by all means. Afghan Men: Mohsen versus Atiq. While Atiq welcomed the Taliban ways and was perfectly integrated in their group, Mohsen looses everything and is living in abject poverty.It is interesting to note that the two characters are profoundly depressed for entirely different reasons. It suggests that Afghan men have two ways of dealing with fundamentalism: you accept it or you try to resist it knowing very well that you will lose at the end. Eitheir way, your life will never be the same. Afghan people have been taken hostage by the Taliban. It is very terrifying to see how people are treated by the “Taliban Police”, men or women. I can perfectly well understand Mohsen and Zunaira feeling’s, having known freedom, wealth and a comfortable middle class life. Furthermore, some people supports Taliban, while others can’t seem to grasp what is happening to them and to the city. Some passage was so dark and depressive. The portrayal of the Taliban: No surprises here. They are portrayed the way we usually see them elsewhere. Religious hardliners, no sympathy or mercy for women, men must fall in line otherwise they will burn in hell’s fire. Kabul: I was really sad to read about the state of Kabul. One the ugly consequences of war is that the city is completely destroyed. People are left leaving in graves. Great book, not the most happy read out there but I recommend. Did your read this book? What did you think? Exactly Celestine. I agree… Khaleid Hosseini’s Kite Runner was in my mind the whole time I was reading this review. Thanks for sharing.